The Archaic temple of Aphrodite is dated to the end of the 6th cBC and it was originally discovered during excavations in 1936, only to be lost years later in the destruction of Nazi occupation of the city and the subsequent post war development. It is at the beginning of Dioiketeriou street. It was situated at the Hiera/Ἴερά district, the sacred temples district of ancient Thessalonike. It was originally built in the city of Thermae, the predescessor of Thessaloniki, and it was moved into the present location during Roman times, a huge engineering undertaking for that time in its own merit. One of the arguments the Skopian pseudo-macedonists is that Ancient Macedonia did not have any Greek temples, and that the ancient Mmacedonians did not believe in the same Gods as the ancient Greeks. Some Skopjean charlatans, like the infamous pseudo-scientists Tendov and Boshevski, professors at the Универзитет „Св. Кирил и Методиј” – Скопје / Univerzitet „Sv. Kiril i Metodij” – Skopje (professor Boshevski is also a member of the SLAVO-Macedonian Academy of Arts and PSEUDO-Sciences in Skopje) go even so far as to create imaginary deities, with invented names such as God Sa, God Ve, God Vo, God Vi, God De, God Ho, God Xo, God Li, God Itchka, God Ka and God Zmija! (The ROSETTA STONE and the Tendov-Boshevski controversy-Illusions of ancient grandeur through Balkan pseudoscience. 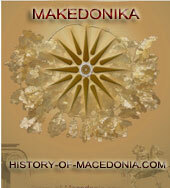 http://macedonianissues.blogspot.com/2010/01/blog-post.html). In Greece the expression goes that “Marbles do not lie”, meaning that while every charlatan can invent any pseudo-makedonski theory they want, but the proof is always to be found in the documents of the ancient epigraphy, by the facts in the ground. The temple of Aphrodite in the center of Thessalonike speaks clearer about the Hellenic nature of this ancient Macedonian city that bears the name of Alexander the Great’s half sister Θεσσαλονίκη/Thessaloniki than any Skopjean loud cries and screams about a supposed proto-Slavic “Makedonka” Солун/Solun. The site of the temple is on private land. The owners want the temple ruins to be covered and a permit to be allowed for building a residential condominium building over it. Besides being an outrageously sacrilegious insult against Greek culture and archaeology, the uniqueness of the temple, being the oldest building in Thessalonike and one of the earliest and most complete examples of Greek religious architecture in Macedonia. This is not a trivial issue and not a local issue either. 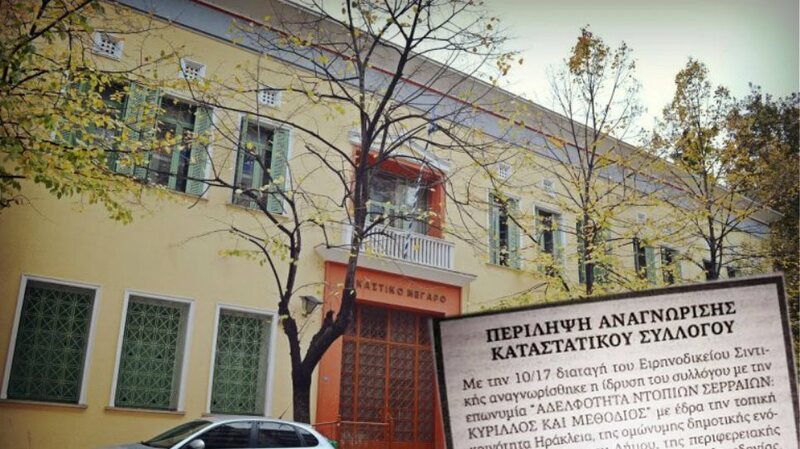 All defenders of Hellenic culture need to intervene and support the purchase of the privately owned city lot by the Greek Archaeological Society. The archaeological site of the temple of Aphrodite needs to be restored and developed for visitors and scholars and for the visual enjoyment of the local Thessalonians too. The architectural members of the temple have been recovered during excavation in the 1930’s and they are housed or being in display in the Archaeological Museum of Thessalonike. Few cities world wide have been blessed with such multi-leveled archaeological strata. 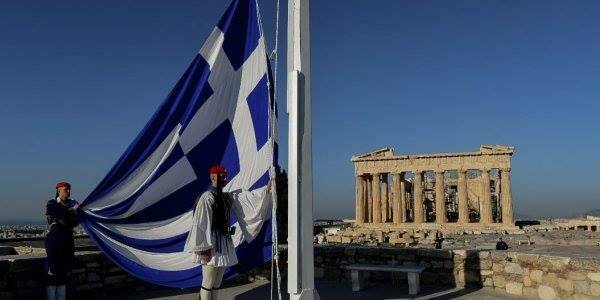 Thessalonike is the envy of others in this respect. The poor Skopjeans have zero proof for their baseless and unhistorical claims over ancient Macedonia. All they can do is use names of ancient Greek kings, paraphrasing them to confront to their Slavonic language, Филип/Filip for Φίλιππος/Philippos and Александар/Aleksandar for Αλέξανδρος/Alexandros, in order to re-name Yugoslav streets, stadia and highways into “Makedonci” ones. 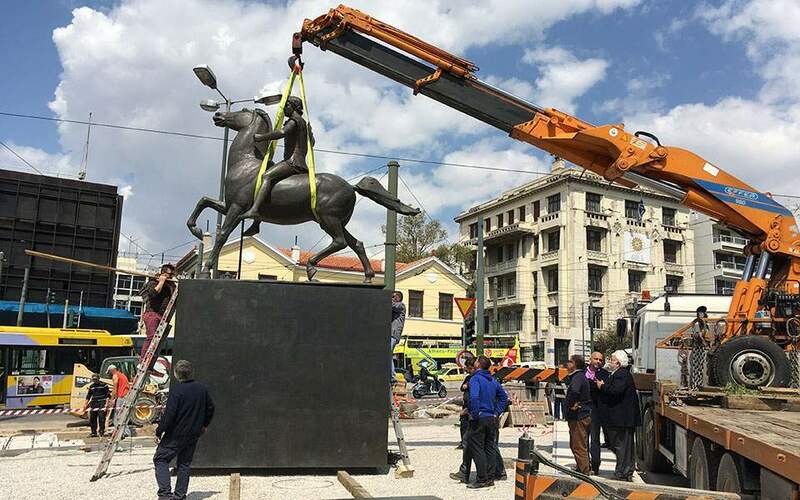 To their dismay, the land their forefathers conquered back in the middle ages, during the descent of the Slavs into the Byzantine Balkans, is not cooperating: all the Statues that they discover when they dig into their earth have Greek inscriptions, on them. 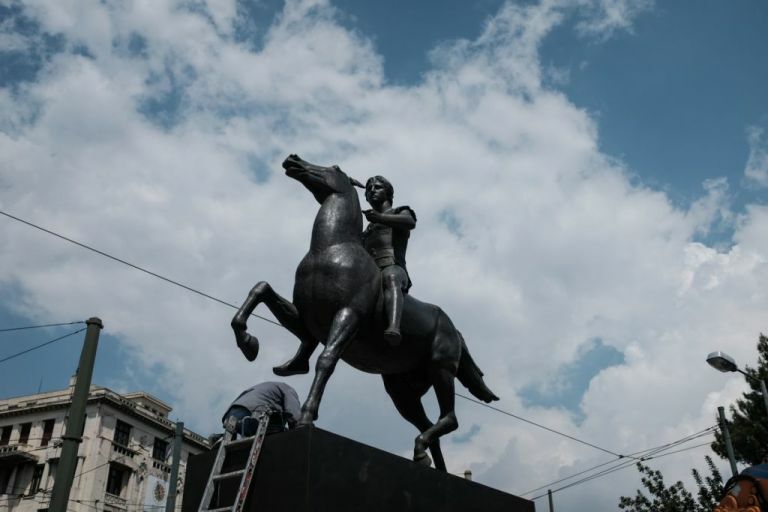 To dupe their own population into believing their fantastical nationalist myths of fake Makedonism, FYROM’s Government goes to Italy and orders modern statues on which they pay the Italians to scribe Cyrillic letters to raise them in the middle of the Dardnanian city of Scupi, modern Skopje. Greece, like China, is a country of four thousand years of undisrupted habitation of the same historic people, with continuity in culture and history, and millennia of survival and development of its language. 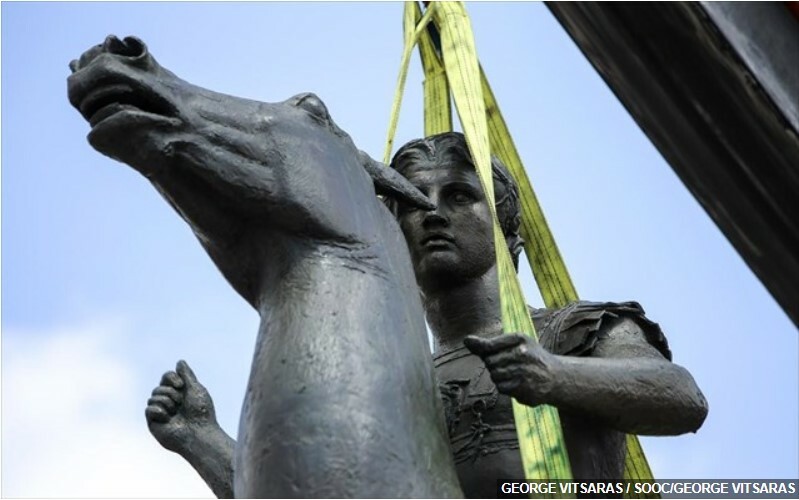 The legacy of the ancient Macedonians is not attested only in the Greek language of the modern inhabitants of Makedonia, in Northern Greece. It is also attested in the vast cultural relics spread throughout Μακεδονία/Macedonia: Homeric Macedonian “Toumbes”-tombs, ancient Greek theaters, Hellenic epigraphy and, of course, Temples to ancient Greek Gods and Goddesses, like the aforementioned Naos-temple of Aphrodite in downtown Thessalonike. The Greek Archaeological society needs to buy out the city lot in which the foundation and base of the temple has been discovered from the private owners and to do what they do best: restore the temple Aphrodite in downtown Thessalonike in a meticulous, scientific way, stone by stone, following the Venice convention Archaeological standards, like they do in Archaeological sites throughout Greece.